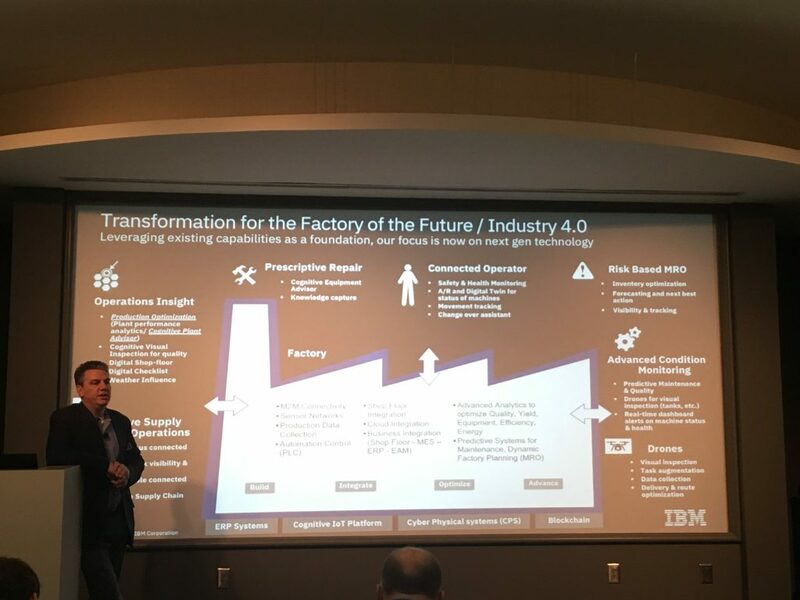 Industrial IoT World kicked off with IBM’s NA Industrial GM, Albert Opher inspiring Future Forward leaders to go on the offensive when faced with industry disruption. “The Future Forward Enterprise is not an evolution- it’s a revolution,” he said. Companies need to harness data, technology and people to build new competencies. Companies like Maersk, Whirlpool, and Sandvik are using new technologies like blockchain and AI to create new business models and streams of revenue. Are you ready to disrupt? Take the assessment. Later that afternoon, David Meek, IBM’s Global Leader for Industry 4.0 & Smart Manufacturing, led a session on optimizing IoT delivery through the right platform. When selecting a platform, consider how easy it can scale across your organization. It should also be secure- so you can prevent unauthorized connections. Finally, look for a partner with deep industry expertise. IBM Watson IoT works with clients across industries- more than 6,000 client engagements in 175 countries. The IBM Watson IoT Platform is using applied AI and analytics to transform industries, one example being Sandvik, a leading global provider of Rock Technology Services. Watch the video below to learn more about Sandvik’s story. The following morning, David Meek led a breakfast discussion on improving performance by transforming operations. According to David, companies often ask us how to get started with Industry 4.0 projects. Focusing on the data, the platform, or IoT tinkering, typically ends in a false start. He recommends you start with the business value. David worked with a cement company whostarted by identifying the optimal energy efficiency operation condition in the ball of one of their largest plants. This brought them savings of 10%, which can be used to fuel their next IIoT project. Successful companies are also skipping the Proof of Concept stage in favor of a pilot to deliver value to the business faster. 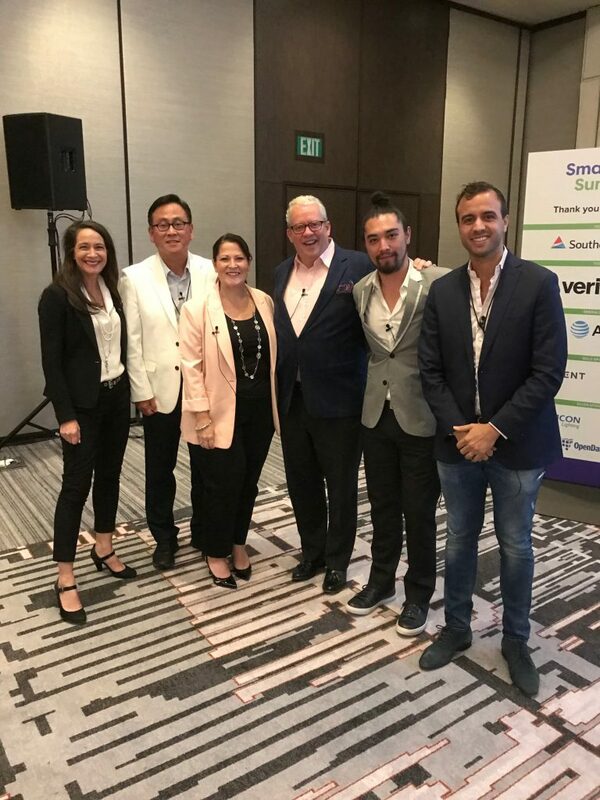 Later that morning, Heather Preu, IBM Watson IoT’s VP of Global Sales GTM & Enablement, joined a panel of experts to discuss how new technologies will revolutionize the future of Industrial IoT and Smart Cities. “There’s so much data and how do you do something with it? Augment it.” Heather says. You can achieve this by managing your assets in the context of an entire system of assets. For example, a pump’s individual performance might appear to be suffering based on output and drawing load. However, a view upstream might find that a chemical imbalance in the water being pumped is causing the rise in temperature. Being able to collect the real-time data and analyze it for the purpose of putting individual asset performance in the context of overall operations is critical. That is not where our solutions stop. With AI, we can predict based on weather, consumption and system historical performance. 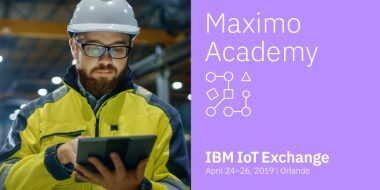 IBM demonstrated how AI-infused IoT solutions can reduce unplanned downtime, find defects faster and increase throughput. On display was our robot arm demo featuring asset performance management (APM) capabilities – Maximo Health Insights, IBM Acoustic Insights, IBM Visual Insights and IBM Equipment Maintenance Assistant. A global shoe manufacturer used IBM IoT, AI, and analytics to double production without doubling equipment expenses. See an AI-powered factory in action. Explore the 2 minute interactive demo.